One of the best features of Lebanon is that it lays on the Mediterranean sea shore. The blue waters crashing on the rocks, make the most beautiful scenery for a picturesque lunch, or any activity really… It’s really a shame visiting Lebanon and not having a meal or two on the gorgeous Mediterranean shores. Byblos is an ancient sea-side city, dating several thousand years BC. Its charm has stood the test of time, invasions, wars… etc. The ancient feeling and the fact that it’s located right on the Mediterranean makes it one of my favorite places to visit. Before we stopped for lunch in this beautiful city, we strolled the rocky pier, basking in the beautiful spring sun. As you walk along, you get a little mist of the waves crashing on the rocks, dying to come greet you. You can almost taste the saltiness in the air. Fisherman throwing their nets into the water, hoping for a good catch. 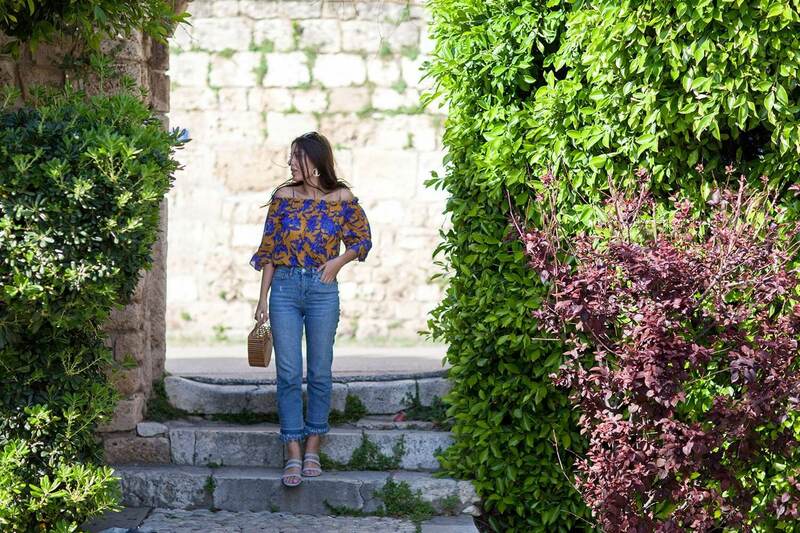 It doesn’t matter that you’ve been here many times before, each time you will be amazed by Byblos’s beauty. 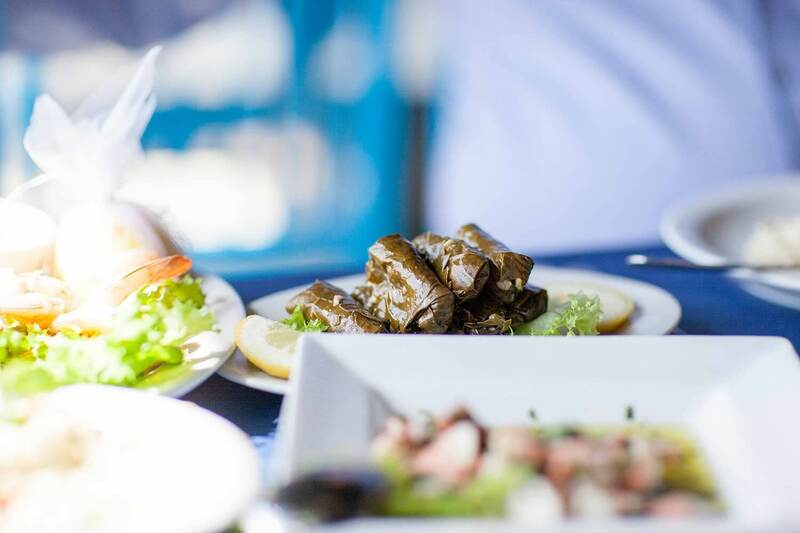 Right on the pier, a few restaurants stand side by side, serving Lebanese mezze and freshly caught seafood. 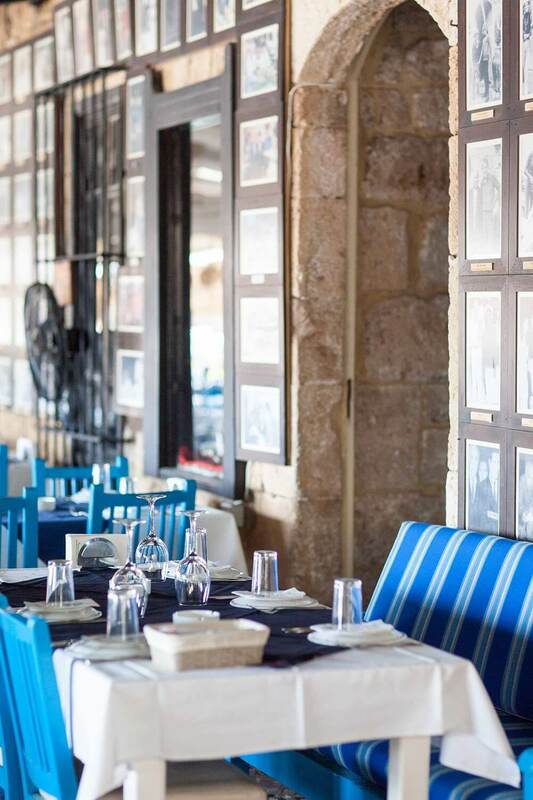 Although they’re all similar, Pepe Byblos Fishing Club stands a little differently. Opened in the 60’s, the world’s biggest cinema stars, intellectuals and even presidents have frequented it. Head over to the side wall, covered in framed pictures of the most famous people that have visited it throughout the years. 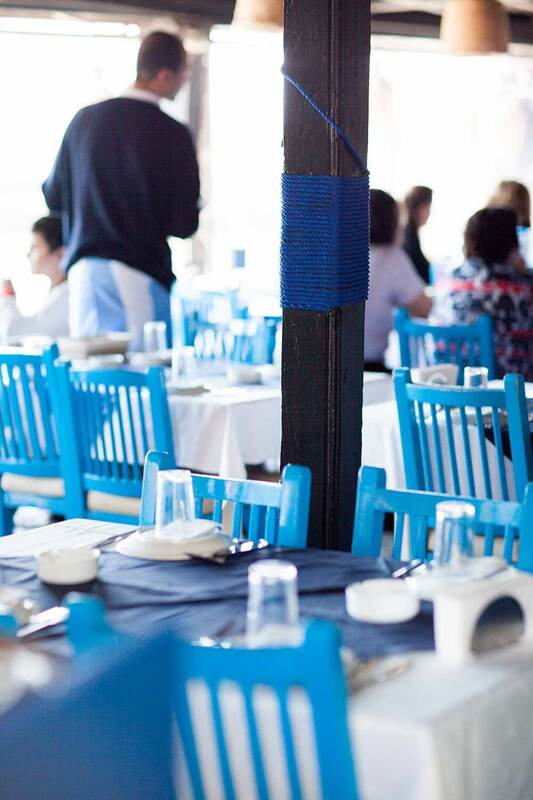 The maritime theme is dominant with the blue chairs and white tables. We picked a table right on the edge of the terrace, overlooking the pier and the ancient castle. From octopus to shrimp to local fish, the meal was exquisite. We finished off with a bowl of pudding before saying goodbye to Byblos, promising one more visit before going back to San Francisco. Wow! Great shots darling, btw your bag is just insane!!! I love your top and wow, the bag is so lovely and unique. Loving the floral top, so pretty on you! I’m glad you liked it Elizabeth. Man…these photos turned out fabulous, Tamara!! Thank you Jodie!! The place is just so pretty it makes photography just so easy. Thank you dear! I’m so glad you liked them. you look gorgeous loving the top and of course the bag!! 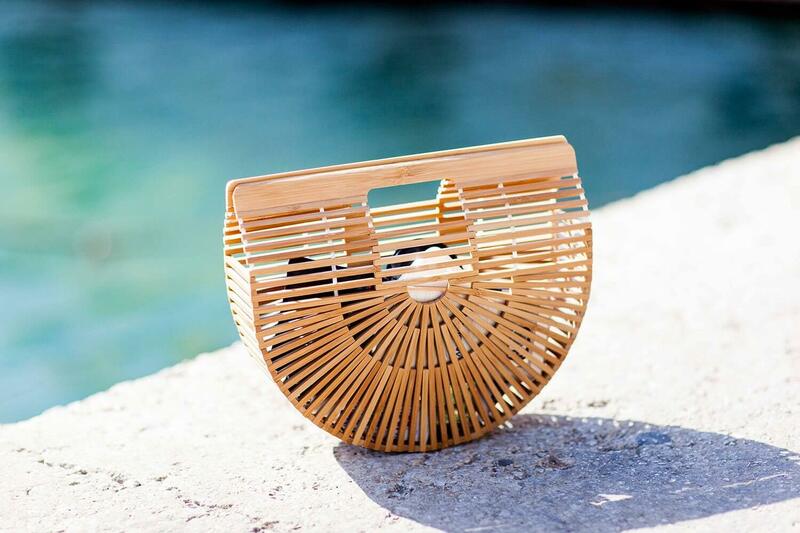 I love this Cult Gaia bag! It’s really hard not to love it. The food looks so good! Your top is really cute too! Thanks Jennifer. The food was indeed so delicious! So obsessed with this look, love your bag, top, and sunnies! Thanks Taylor, have a great day! Wow this is beautiful! I love your whole outfit and that blue/gold top is just gorgeous against that scenery! Love your outfit, the top is so pretty!! I love anything off the shoulder at the moment. Same here! My wardrobe is 90% OTS right now! Wonderful photos! Byblos seems an lovely place! Love the jeans! It is indeed! Thank you and I’m happy you enjoyed the photos. “It was a delighftful read, thank you for sharing this my dearest!!! Thank you for stopping by Hadasah! Byblos looks absolutely gorgeous! My boyfriend’s family is from Lebanon and I’d love to visit one day with him. I’m very jealous of your Mediterranean travels! I have a lot of friends and professors visited Lebanon and they said that it is one of the most beautiful places they have ever seen, so you are lucky that you were raised there. I missed you from Youtube this week, hope you make it on time the following week. I so need a get away. It looks like a beautiful and relaxing place. The photos are stunning. Love the outfit! The Mediterranean looks so fabulous. I hope to vacation there someday! You’ve taken wonderful photos!